Every single day, there are over three million business travelers hitting the road, trying to close the deal. Millions more are hosting clients over coffee and lunch, working to make a sale or add to their company’s bottom line. All of this travel and activity generates expenses, which are challenging to track. For businesses wishing to track and manage their expenses more effectively, this can often be a time-consuming process. It doesn’t have to be that way, however. Smartphones, tablets, and other mobile devices, powered by great apps, can make transform how you account for expenses. Here are 5 great expense-tracking apps that can help businesses and employees record and account for business expenses better and faster than ever before. If you want to go paperless tracking receipts, Foreceipt is one of the best apps out there. The cloud-based receipt-capturing app (it uses Google Drive) enables you to securely capture each receipt for all business expenses accrued; just snap a picture of the receipt, enter the amount and the merchant, and you are good to go. Foreceipt has several great features embedded into the platform that make it a good choice for businesses. For example, it allows you to establish budgeting categories, so you can track the types of expenses you or your employees are incurring. It also has a built-in exchange tracker, which allows you to input expenses in any currency. Certify is another great choice for small businesses to capture and track expenses more effectively. This is another cloud-based platform that helps employees rapidly capture and send expenses incurred on business travel. Certify’s platform is especially good at enabling businesses to review employees’ business receipts, and then approve or disapprove them. Certify allows for receipt capture on mobile apps, faxes, and scanners, and additional software, such as ReceiptParse and ReportExecutive, can enable companies to automate their expense tracking much more effectively as well. Certify can really help business travel, a critical component of any successful company, more manageable for firms with a lean front office. If you are already using Evernote to connect your employees together to collaborate more effectively, then Receiptmate may be your expense-tracking app of choice. A fully integrated Evernote client, Receiptmate allows you to scan receipts into Evernote, tag them, and even track expenses by category. The app can transcribe data off of receipts automatically, saving you time and effort. Like many of the other apps, it also allows you to create categories, budget your expenses, and generate reports. Moreover, since your employees are already used to using Evernote, training them to use Receiptmate should be a relatively painless affair. Shoeboxed is another great expense tracking app, perfect for business people who spend days on the road. Shoeboxed allows business travelers to rapidly capture and categorize business expenses, and makes it easy for companies to verify them in real-time. The app’s powerful receipt tracking system also makes it easier for accountants to categorize your expenses, too, which will make it easier to prepare for tax season. Finally, unlike many receipt-tracking applications, Shoeboxed also enables users to easily capture business cards, and transform them into an easily accessible digital contacts list. 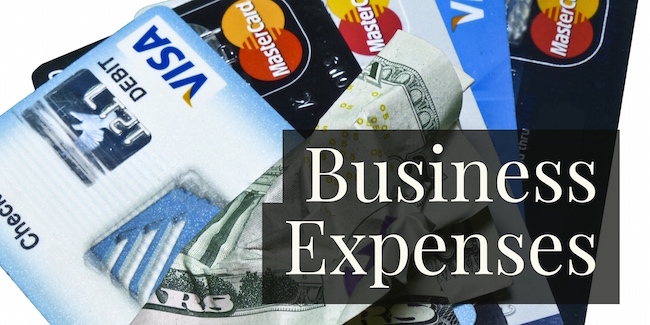 Expensify is another powerful app that can help companies and employees effectively track business-related expenses. Like many of the other apps here, Expensify makes it extremely easy to scan and input receipts to track expenses that accrue in routine business. However, Expensify is particularly adept at enabling small to medium-sized businesses automate their review and approval processes; simply establish business rules, program them into Expensify, and the app will automatically review and approve expenses your employees incur. Expensify will easily integrate into many digital accounting platforms as well, making it a great choice for effectively tracking business expenses.